Rat incisors are designed like chisels, with hard yellow to orange enamel on the outside—the cutting edge—and softer white dentine forming the rest of the tooth. 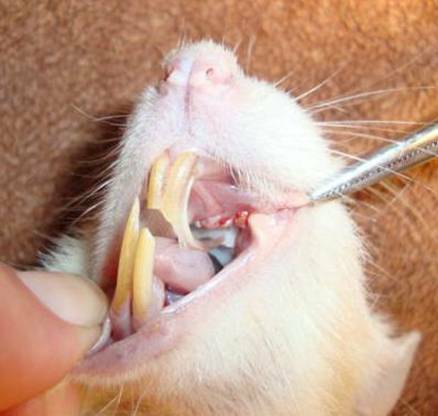 Because rat incisors grow continuously, overgrown teeth are a possible problem. You may have heard that unless a rat has wood or other hard material to chew his teeth will overgrow, but this isn't true. The teeth overgrow only if there is a medical problem which prevents normal tooth grinding. In healthy rats, the upper and lower teeth are lined up and keep each other sharp and the proper length by grinding together. Here is a photo showing normal rat teeth. If a tooth is knocked out of alignment, both it and the opposing tooth will become too long. Overlong teeth can rub sores in the mouth and prevent the rat from eating. The first symptom of a tooth or jaw problem, if the abnormal teeth aren’t noticed, is usually weight loss. Abnormal teeth are usually crooked or uneven. If the teeth are straight and even they are probably normal. If you think your rat’s teeth are abnormal, compare them to another rat’s teeth. If there is a tooth abscess or problem with the nerves or muscles on one side of a rat’s jaw, the teeth will commonly wear unevenly or overgrow. The rat may stop eating hard foods, due to an inability to chew normally. This inability to chew may be caused by either pain or physical disability. I know of this problem occurring in two rats where the problem eventually progressed to acute pain in the jaw, perhaps caused by heart problems. So, although I haven’t had occasion to use this treatment since then, I suggest that in cases such as this giving the rat pain medication on a regular basis may help the problem and allow the rat to chew more normally. Here is a photo showing a case of overgrown teeth, where the left top incisor was only being partially ground off, resulting in a long sharp spike that curled back into the roof of the mouth. See how the teeth are worn unevenly. The lower incisors are actually shorter than normal, especially the left one, and both upper incisors are longer than normal, even without counting the sharp spike. Rat teeth don’t contain nerves, so trimming them is painless. However, it isn’t unusual for the gums to bleed slightly after the teeth are trimmed, especially when trimming bottom teeth, due to the pressure applied to the tooth. Overgrown teeth will need to be trimmed every 1-3 weeks, depending on the type and severity of the problem. Lower teeth grow 2.8 mm per week, and uppers 2.1 mm per week. So in a month, they can grow up to ½" too long! The teeth should be trimmed whenever it looks like they’re long enough to rub a sore or cause difficulty eating. 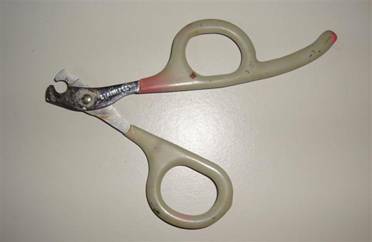 The best tool to use is cat or bird toenail scissors. Keep in mind that any clippers used on teeth will quickly become dull and useless for nails. Teeth are brittle, so you can't really cut them. Instead, the goal is to get them to snap off in the right spot. Rarely, a tooth will split down its length, but so far I haven’t seen this cause any long term problems. It’s best if one person can hold the rat while a second does the dental work. To restrain your rat, you can try just holding him in your hands or wrapping him in a towel. If he still struggles, you can make a straight jacket (see below). If using a towel, wrap it tightly so he can’t get his hands out. If using your hands, try letting the rat stand on his hind legs on a table or on your chest or lap, then hold the head with one hand, and the rat’s hands with your other hand. Try to angle the clippers so that the tooth will retain its original bevel. Top teeth should be clipped to a length of ¼", bottom teeth to ½". Be very careful to hold the lips out of the way. As long as you carefully place the clippers around the teeth before you cut, there isn’t much chance of the tongue or lips getting in the way. All owners should check their rat’s teeth occasionally to make sure they’re normal. 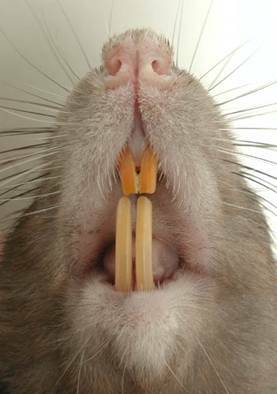 If your rat has missing teeth, malocclusion, or unevenly worn teeth, check the length of his incisors frequently to see if trimming is needed. Step 1. Cut a piece of 2" stockinette 6" longer than your rat, or cut the toe off of a long thin child’s sock. Step 2. Measure around your rat’s neck and cut a piece of ½" adhesive tape 1" longer than this. Wrap the tape around one end of the stockinette or the cuff of the child’s sock, so it’s even with the edge. Overlap the ends of the tape 1".